January | 2010 | Promotional Incentives, Inc. Desk Calendars – A More Popular Gift Than Chocolate? For nearly 20 years, I have loved, lived and breathed promotional products as an effective means of marketing and branding companies. In every fiber of my body, I believe it is one of the most effective and targeted forms of advertising. Admittedly, I could talk about it for hours but when real life reaffirms my belief to my clients, that’s even better. 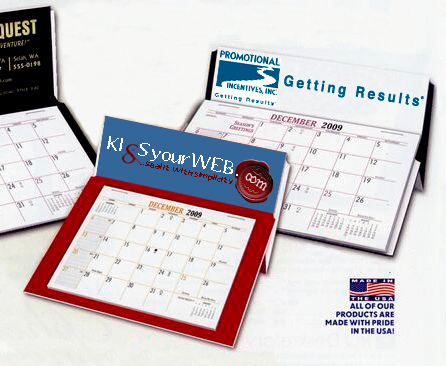 Case in point, desk calendars are a popular thank you gift, especially for real estate and financial service industries. To help our clients who have many individual agents maximize their buying power, we offer a co-op program combining each order for a much lower price, with personalized contact information for each person or team. Last week, one of the agents who chose not to participate in the program, called to ask if we had any extra calendars that he could have. Turns out, one of his top clients, whom he thanked with cards and Ghirardelli Chocolates, still wanted the calendar. So the disappointed agent had to ask another representative for a calendar to fulfill this request. That must have been a very good client. Hmmm…maybe I can get him to order early this year.